Wow, 3 weeks without a GameLog. 2 Uni assignments kinda killed the gaming of late (as well as the blogging). PC had a hiccup too, so it now has a new PSU, Mobo and memory to see it through to retirement. Warhammer Online (20h) - Bad time for the head start and full release of the game. wish I had more time to put into it. Now I'm clear of Uni for the year it's going to get more of my attention. Spore (5h) - Attempted some SporeLogs, but the game didn't keep my attention long enough to really do them justice. Was fapping about on 43folders and saw an interesting article about time & attention called: Who moved my brain?. Well if my brain is the internet through google then it looks like someone took the article itself! typing into the wrong window for the past 60 seconds, often with comical results. If he didn't reach for his mouse, he'd reach for the backspace key, which he would press, on average, the same number of times he had pressed other keys. Nice qoute about people who cannot touch type (Eg: me). Steve's little rant hit a chord somewhat, but I feel that this area is the only one I'm victim of. I comment code profusely, I write long design documents, I contribute to the social wealth with discussions through forums, IRC, IM, Experts Exchange etc. Dr. Nichols: what did you have in mind? Leonard McCoy: Perhaps the professor can use your computer? Montgomery Scott: Computer. Computer. Ah. [McCoy hands him a mouse and he speaks over it] Hello, computer. Montgomery Scott: The keyboard. How quaint. Unlike Steve's experience of being "forced" through typing, I never even had the chance. Typing was only offered in my school a year or 2 after my grade. I was a little envious of some computer geeks coming through behind me that got the offficial touch-typing training, but at Uni I would say only 50% knew how to touch type. Let's face it: it's lazy. Picked up from KezNews funnies. 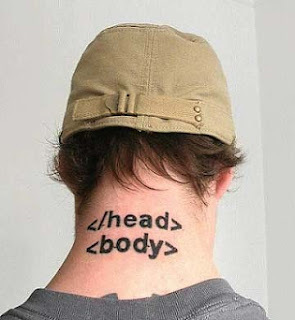 That would be great if it's a tattoo, but funny enough even if it's not. Continued on with VRWorld II, the 2nd planet in my "savegame" system, with Mobysore bopping along in his spaceship. A lot of the frustrations and general 'meh'ness over the other levels faded away as I got more used to the controls in space mode and started interacting with other colonizations. The missions were pretty good to start with, but it seemed like there were patches where you would be rolling in money followed by 1/2 hr of scrounging for every skerrick. I had generally kept the peace and relied on the missions to set the tone of the game, but blindly clicking accept nearly got me into a war I didn't want. Eventually one of my warlike neighbours had a go at me and took over some of the planets until they almost ringed my homeworld. It took me a while to figure out the usefulness of tier 1 & 2 colonies as well as the cheapness of home base rebuilds. The last point led to a wierd stalemate in the war where there doesn't seem to be any real consequence to dying apart from being returned to your homeworld, but if you're defending on your homeworld you effectively have infinite lives. It then comes down to whether you can stop them destroying your cities before you can kill them. I got frustrated though that I was caught in a loop of defending my home planet, rebuilding it (they need an instabuild button), fending off raiders on another planet, then back to defending the home planet again. Gone were the mildly interesting quests and the possibility of exploring, there didn't seem to be an end in sight. Achievements finally came through for all the shooting I had done and once I had a better missile and laser beam the battles became more easy, which then left time to trade, which got more money, which helped build out my ship further. All of a sudden I could trounce through their bases and with them gone the game turned back to a more civil land grab. Picked up spore collector's edition on Wednesday (someone broke the release date) and have been playing it solidly for the last 2 days. Too solid for blogging about it, or even sleeping for that matter. I walked out of the shop smiling and actually caught myself giggling as I mulled over the possibilty of going straight home at lunchtime rather then heading back to work. I haven't been this excited about a release in ages. Spent a bit of time at lunch looking thorugh the "Art of Spore" book. 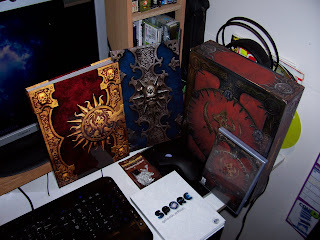 Not as coffeetable-worthy as the WoW ones, but not too bad. After a looong install and dinner, the game was ready. It had installed over top of the Spore creature creator directory and the starting interface managed to pick up my previous creations. Good ole' Mobysore. Tide pool was great. I had read in the art book that they tried to portray the feeling of "something is always bigger than you". You may grow up past one species, but there's something else on the horizon. What is really clever is the use of focus (throughout the game actually). The tide pool is essentially a 2d world, but each "level" is layered below you so that the backdrop of one level may be the massive eye of a creature a couple of levels away; a warped watery vision of the future. This vision is intentionally unfocused so that you can distinguish what is really in the level and what is backdrop. Works well. Another cool thing is the food for herbivores. It starts off as gluggy green blobs floating randomly around, but after a few levels you come across green edible blobs surrounding a green structure. After porking through this great little find you advance up in size and now find out that the whole green structure is now edible, and that floating around you may brush up against those new green globs as part of an even larger structure. It took me a couple of levels to realize the simplicity and genious of this design. It's trees. Just like seeing the next few levels of opponents, the "trees" show the advancement of not only creatures, but of plant life into more complex structures. The tidal eddies take a little getting used to, but one the whole the tidepool level was great, if a little short (Portal short, doesn't outstay its welcome, leaves you on a high). Onto the creature stage and it felt like home back in the creature creator. It was odd that lots of options were missing, but they come by collecting them from the world. Some are lying on the ground in bones, some as a reward for "dominating" other creatures. It's kind of funny looking back that it's like you're sifting throug the bones going "ohh, leg bone connected to the hip bone. I'll try that next evolution" or looking at a creature you've fought or tamed with a similar assimilation perspective. Befriending other creatures turned into a monkey see monkey do game and got a little boring, especially when it wasn't clear why you were failing sometimes. Trying to befriend a creature more advanced than you is impossible if they have siblings dancing with them. Finally I figured out that if you can get one by themselves and you have a couple of teammates you can easily seduce any animal that doesn't attack you on sight. Played through as a herbivore with only slight warlike tendancies so next time I might go all out carnivore on hard level. The biggest wow moment happened in the latter stages of creature mode when my migrating pack ran afoul of a massive ball of steel on legs! My Mark IV had been picked out of previous creations and brought into the game as an elite monster, 4 times higher than anything else and 10 times the hitpoints. I was laughing and showing Sandy about how glorious it was watching my current creature being gobbled up by another personal creation. Tribal mode seemed to be a little hiccup on the journey to civilization. It melded in Ok in the grand story, but the game mechanics itself didn't really grab me. I was struggling more with the controls and interface rather than experiencing the content. Settler mode wasn't much different with a typical RTS-like feel without typical RTS controls (like group hotkey assignment). I spent more time designing the buildings and cars than playing the game, and altohugh it's kind of cool seeing the same UI being employed for vehicles and structures, I just wanted to get on with it. Finally made it out to space with the Omicrons, but one of the missions burped and I couldn't save either so I think I quit out. Returning back to the planet and the game wanted me to restart at creature stage. Luckily it had registered that space stage was opened, so I started up another planet at space stage with Mobysore. Pity I didn't get to see him dance, but it was cool plonking him down on new planets. Managed to save & sleep a couple of hours into space mode. Still feels a little clunky like civ mode, especially the constant zooming. if you click on the - or + signs it will do a near instant zoom out or in one level, so why not have a button to do the same ? I kind of blame uni again for my lack of efort in updating the GameLog, but last week was pretty cruisy and I still didn't get up the energy to roll off the stats. Might be close to wrapping it up?